What is Audemars Piguet Watches? A trio of warships christened Royal Oak, named after the legendary “royal oak” – a hollowed out tree which offered King Charles II a safe hiding place from his pursuers – lent their distinctive name in 1972 to an equally distinctive luxury sports watch – the Royal Oak by Audemars Piguet. Since then, the Royal Oak has become the leading model of the world-famous firm in Le Brassus and helped the stainless steel wristwatch attain respectability among watch lovers around the world. The Audemars Piguet story begins in 1875 when twenty three year old watchmaker Jules Audemars and future partner Edward-August Piguet, just twenty-one years of age, met in the Vallee de Joux. Both had learned the watchmaker’s trade after finishing public school in their hometown of Le Brassus by training at the bench and returned to the Vallee de Joux to find jobs in the local watch making industry. Jules Audemars was soon producing raw components for watch movements, while Edward-August Piguet sought employment as a “repasseur” (a master watchmaker who performs the final regulation on a watch). Shortly after their meeting in 1875, the two talented watchmakers decided to join forces and founded the firm that would someday come to be known as Audemars, Piguet et Cie. Almost from the beginning, Audemars was in charge of production and the technical side, while his partner Piguet focused on sales. Their partnership was not an immediate success, however. In fact, the Audemars Piguet trademark was not even registered until 1882 and the firm’s “official founding” did not take place until 1889. Already, however, Audemars Piguet et Cie had become the third largest employer for watch manufacturing in the Canton of Vaud. More importantly perhaps, both men had deliberately shifted their focus towards the production of high-quality, complex, ultra-precise watches. Shortly after the official founding in 1889, a branch office was built in Geneva and the partners decided to produce all of their components and assemble the finished watches in-house. This allowed the firm to maintain strict quality control over their products and as a result, only products of the highest quality left the workshop. In short order, the greatest, most renowned retail jewelers were ordering watches from Le Brassus. Today, one can find many Audemars Piguet pocket watches identifiable as an Audemars Piguet only by their serial number, the result of prestigious jewelers, such as Gubelin and Tiffany & Co., wanting only their own name engraved on the movement and case, and not that of Audemars Piguet. It is interesting to note that between 1894 and 1899, a mere 1,208 watches were produced. Among these were some of the most sophisticated timepieces ever made, including the legendary “Grande Complication” series, which is still being produced today. Aside from normal time indication, a Grande Complication timepiece offers minute repetition, perpetual calendar, and chronograph. At around this same time, the retail operations in Geneva and London were transformed into full-service branches where watches were not only serviced but also assembled. By 1914, Audemars Piguet launched a project to develop a watch so complicated that it would take six years of continuous production before the watch could be delivered to the importers Guignard & Golay in London. The watch in question was a pocket watch with two dials and a one-minute tourbillon mechanism. As well as a tourbillon, this double dial Lepine, gold watch included a minute repeater, a chronograph with 60-minute and 12-hour counters, perpetual calendar with displays which “jump” at midnight, display of the leap year cycle, the “age” and phases of the moon, and power reserve display. The second face showed an additional 24 hours based on the sidereal hour, moving a pair of independent hands. A special system connected to this gear-train makes it possible to see the changes in the London sky at any time of the day or night, through an oval-shaped opening in the rear dial. The sky is represented by 315 stars engraved on a plate of gold, enameled in blue. The stars, with their respective names, are all clearly visible . Unfortunately, it was the last triumph for the founding partners. Audemars died in 1918. The following year, so did Edward Piguet. After the founders’ death, Audemars Piguet continued to prosper, establishing several technical milestones with the creation of the world’s smallest minute repeater watch, having a diameter of just 15.8 millimeters; the debut of a Hunter Model (hinged-lid pocket watch) with a jumping second hand, also featuring a barometer, quarter repeater, independent second hand, the date and day of the week; and in 1925, another first: the world’s thinnest pocket watch measuring just 1.32 millimeters. The year 1928 also saw the development of the world’s first skeletonized pocket watch. Needless to say, then as now, Audemars Piguet was considered one of the finest watch manufacturers in the world. Business boomed, as did the world economy. 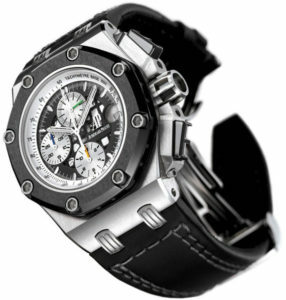 Customers of Audemars Piguet included such prestigious jewelers as Gubelin, Tiffany & Co., Cartier and Bulgari. Unfortunately, the company’s success ground to a shocking halt in 1929 when only 737 watches were sold. By contrast, nearly 2,000 watches had been sold in 1920. With the stock market crash in 1929 and the subsequent Depression, there were suddenly very few customers for expensive watches. Like other Swiss watch companies, Audemars Piguet was forced to layoff most of its workforce, until hitting rock bottom in 1932, when just two watches were produced. Despite the hard times, the company bounced back following World War II, thanks to the success of its chronographs and ultra-thin (the famous nine-ligne calibre 2003) dress watches. The 1950′s and 1960′s saw a major rebound in the firm’s sales. In 1967, in cooperation with Jaeger LeCoultre, a new record for the thinnest (2.45 mm) automatic movement, with a centrally placed rotor of 21-carat gold, was established. Just three years later, in 1970, the watchmakers of Audemars Piguet premiered the world’s thinnest movement (3.05 mm) to include date display and a central rotor made of gold. The year 1972, of course, marked the debut of what has become the signature model for Audemars Piguet, the “Royal Oak “. Designed by the legendary watchmaker Gerald Genta, its octagonal shape, steel edges and the use of prominent hexagonal screws as a design feature strike a perfect balance between power and elegance. Worthy of its name, the Royal Oak has since become a legend. Its octagonal design, originally produced only in high-grade steel, took the breath away even of many professionals. However, when the Royal Oak was unveiled at the 1972 European watchmaking fair in Basel with a price tag of just 3,300 SFr. 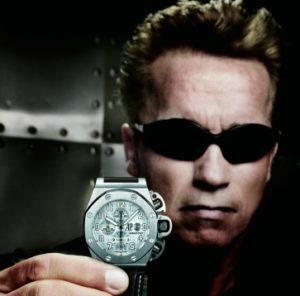 — unheard of for a watch bearing the Audemars Piguet name — its success was beyond even its creators’ expectations! In 1993, the company museum, housed in the original workshop of Jules Audemars and Edward Piguet, was established. This museum, a tribute to the company’s visionary founders, allows watch enthusiasts to discover Audemars Piguet technology “from A to Z.” Its exhibits retrace the key stages in the company’s history, and show many of the creations that made Audemars Piguet famous, including the Grande Complication. As well as its unique collection of antique watches, and in particular of watch complications, this very unusual museum enables visitors to see the intricacy and precision required in horology, by observing two master watchmakers at work in the modern Audemars Piguet atelier which is a permanent feature of the museum. That same year, a new model in the Royal Oak collection premiered: the Royal Oak Offshore, which is water resistant to a depth of 10 atmospheres. The Offshore model offers following functions: chronograph to 1/5 second, tachymeter, 30-minute counter, 12-hour counter, date display, seconds display, automatic movement with central rotor in 21-carat gold. Three years later, in 1996, a wristwatch version of the famous “Grand Complication” premiered at Basel. More than 600 components are contained in an integrated movement that does not exceed 8.5 mm in height. It is a technical marvel that marries old-fashioned craftsmanship with cutting-edge technology, such as computer-aided design (CAD). It was also in 1996 that Audemars Piguet embarked on a new era, becoming one of the first major watch companies to represent itself on the Internet with its official Website. Today, Audemars Piguet remains one of the most prestigious watchmakers in the world — yet despite the company’s enormous success (AP even owns 40% of Jaeger-LeCoultre), every watch is still made by hand the old-fashioned way – one at a time. Today, along with Patek Philippe (PP) and Vacheron Constantin (VC), AP is considered to be one of the “big-three” as one of the finest watches in the world.